3 Keys to Growth: Dream. Team. Lean. When your company is growing — either in revenue, people, or both — it’s an exciting time. Your strong value proposition, coupled with hard work and execution, are clearly starting to pay off in tangible ways. It can also be a scary time. If your company is growing, then, what should you be focusing on to ensure you maintain momentum? Here are three quick keys. Some people think the dream stage only happens pre-growth. In reality, the dream stage is happening constantly. As you grow, new dreams and possibilities arise for your organization — but you need to have parameters for approaching them in a sensible, realistic way to maintain your growth. The ‘dream’ is what engages, inspires, and excites your team. If the ‘dream’ isn’t articulated, or isn’t clear to everyone working on it – even during your growth and maturity stages – disengagement and turnover will start to seep in. All of these are important, but the second bullet is especially important. We tend to celebrate entrepreneurship and ‘moonshots’ because they’re exciting and fun to think about. Creating realistic – while still challenging – dreams for your organization, will ensure you continue to experience growth. Take Elon Musk’s SpaceX, for example. That’s a legitimate moonshot. There was a market reality and real demand because of cutbacks to the NASA programs. A company designing dreams outside of market conditions won’t be dreaming for long. Reality will snap back. If the dream is the where, the team is the who. Some senior leaders view people as a commodity, whereby they’re thought of as expenses and not crucial parts of the company’s success. This is backwards thinking in the modern workforce. Successful companies have a commitment to a talent strategy where they put the right people in the right jobs. Your team needs to be mapped-out, identified, nurtured, grown, and evolved. In short, you need to think as deeply about your team as you do about your bottom line. Evolving The Team: As teams evolve and grow, certain people don’t fit the needs or clash with the team-dream alignment. Those people need to go. It’s better for your company and ultimately it’s better for them as well. The Mix: There isn’t a ‘secret sauce’ for developing a team — it varies by industry, vertical, and interactions with managers — but the core aspects needed in a team are passion, talent, experience, and desire to play the game. The Reward Structure: We put people in teams to do work, but reward individuals with promotions or bonuses. This can lead to individuals undercutting their teams to advance their own personal interests. I’m not necessarily advocating promoting entire teams, but you need to think legitimately about your reward structure. Intrinsic motivation drives more results than extrinsic, but if the extrinsic motivators aren’t there at all, eventually the energy of the team will sap. Now that you’ve got your dream mapped out and your team setup, you need to make sure you are running lean. In theory, running lean means ensuring operational efficiency, with some fat — but not too much. It means having the right processes and procedures in place to help you maintain growth. Sometimes, companies assign too much process as they grow, in an effort to (a) control everything and (b) scale effectively. This creates unnecessary process that your team doesn’t understand the need for, so they don’t follow them. Focus on the crucial processes and procedures that will make your business more effective. Running ‘lean’ as a company means creating processes and systems where you’re maximizing time and decision-making ability. Those are keys for any business. Overall, this is the primary context to understand if you’re a growth-stage or a mature company: you have dozens of demands on your time. People are asking you to evaluate revenue plays externally, and internally people want to understand the next steps of the process. It’s very complicated. The best antidote to business complexity is often simplicity. 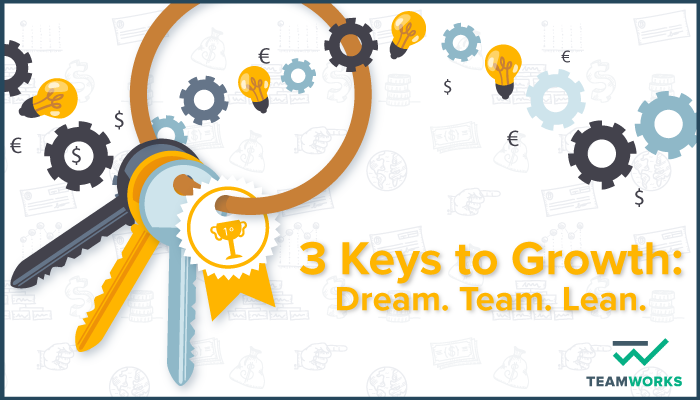 Focus on the Dream / Team / Lean…three key aspects and what you want to accomplish within each. It will be more beneficial intermediate-to-long-term than worrying about every single process. What other ideas have you seen work to grow companies?